Australian and Ethiopian farmers are benefitting from an initiative that has connected growers from both sides of the globe and is shining a spotlight on sustainable crop production and food security. Birchip Cropping Group (BCG) board member and Birchip farmer John Ferrier is involved in the initiative and recently visited Ethiopia, with support from the Crawford Fund. “I learned so much from the trip and was particularly struck by the challenges faced by Ethiopian farmers,” Mr Ferrier said. 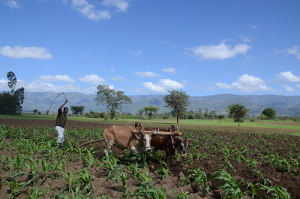 “Ethiopia has a population of 90 million people and 80 per cent of the population are farmers. Population growth, hunger and poverty are the reasons better food security is necessary and increased farm production is the way forward as very little new land is available to be farmed. 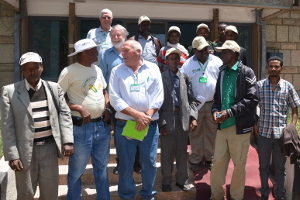 While in Ethiopia, Mr Ferrier also attended meetings about SIMLESA – Sustainable Intensification of Maize-Legume cropping systems for food security in Eastern and Southern Africa program *. The SIMLESA program assisting the Africa farmers by communicating new ideas in the region such as cropping rotations including beans in the inter row with maize, introducing improved drought resistant varieties of maize that are adapted to climate change and climate variability, along with minimum tillage cropping and crop residue management practices. John said SIMLESA is also working on improving seed supply to farmers, developing conservation agricultural system (with most farmers having some livestock) and increasing the supply and use of fertiliser. “The speed with which these new technologies are being adopted is being monitored,” he said. The limited use of fertiliser by farmers in the region was surprising for Mr Ferrier. “When I asked the farmers if they used fertiliser the common response was ‘no’, their justification being that if they spent money on fertiliser they wouldn’t have enough money to feed their families,” he said. 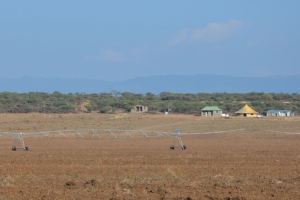 Some of the farms Mr Ferrier visited have been developed with help from SIMLESA and now produce quality maize and bean seed under irrigation to supply farmers with seed for planting, as well as fattening cattle and goats. “Some farmers travel up to 80km on a motorbike to try to secure seed,” he said. “The SIMLESA project is having a very good impact at grass roots level to improve livelihoods of small scale farmers in Ethiopia and Eastern and Southern Africa,” Mr Ferrier said. * SIMLESA is a collaborative project Australia supports through the Australian Centre for International Research (ACIAR) and managed by the International Maize and Wheat Improvement Center (CIMMYT) in collaboration with the Association for Strengthening Agricultural Research in East and Central Africa (ASARECA) and national research centres of Ethiopia, Kenya, Malawi, Mozambique and Tanzania. Additional SIMLESA partners include the International Center for Research for the Semi-Arid Tropics (ICRISAT), the Agricultural Research Council of South Africa (ARC RSA), the Department of Employment, Economic Development and Innovation, Queensland, and Murdoch University in Western Australia.